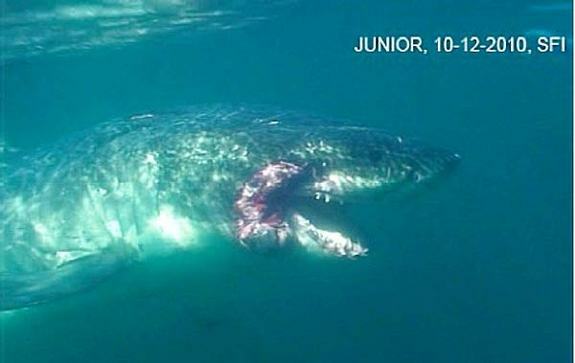 This is Junior, a healthy, male white shark of the Pacific. Image taken in 2009. The hook could not be removed and most of the 13 inch hook was left inside him. The animal suffered on deck, out of water for extensive time as the crew violently pried the buoy from his jaws and tried in vain to remove the hook before cutting it off. Keep in mind he was already dragged by the jaw for several hours to exhaust him. While the hook damage received most of the attention, that wasn't the extent of Junior's mutilation. A large transmitter was BOLTED to his dorsal fin. Remember Junior's dorsal fin images above? Now look again. Right and left view of Junior's dorsal fin shortly after being tagged. Did you know sharks use their dorsal fins to steer? This is Frodo. He was also tagged in 2009. Adding injury to insult, he was ID'd at feedings in 2010 and 2011 with a nonworking tag attached and collecting growth. 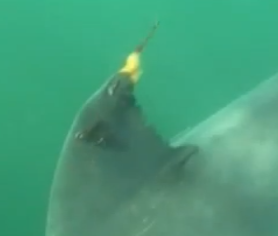 Frodo's dorsal fin was positively ID'd in 2012 with a section torn away where the bolt was previously attached. This once beautiful dorsal fin is a mangled, sad reminder of what should not be done to animals in the name of science. Also, look closely for remaining bolt hole scars indicated by red arrows. Some say Junior's injuries were due to other sharks, rather than mishandling. In addition to the obvious wound around the jaw, other bite marks were also seen on Junior. Indeed, Junior appears to have been bitten (repeatedly) but just because the shark had other injuries doesn't mean the jaw injury wasn't caused by the hook. Does a cut on the same foot which you received a bee sting mean the bee sting is actually a cut? No. Furthermore, if the jaw injury could be proven beyond a doubt to have been from another shark, you then have to wonder why an otherwise healthy looking shark showed up in terrible condition a year after it's mishandling by man. Being that the shark was a year older he should be bigger and stronger, not a bullied, thinner shell of his former self. Sharks clean the ocean, removing sick, weak, and injured animals; it's their role. If Junior was displaying signs of distress, weakness, or mutilation, other sharks are likely to have attacked him. So, even if the jaw wound was caused by another shark and not the hook, the original mishandling is still to blame. There's so much debate over difference of opinion over small details that sometimes the big picture is lost. Remember that the well-being of the shark is the supposed goal. Now remember that most of the crew consists of big game fishermen who are getting rich from their sponsorships and past TV contracts. Most importantly, try to provide an example of how the species has benefitted from this controversial work. Was the shark(s) mishandled? Yes or No? Was the shark(s) damaged? Yes or No? Did the crew get benefit financially? Yes or No? Did Junior or Frodo immediately or eventually benefit from this experience? Yes or No? Can you name one conservation campaign that has been established as a result of Ocearch's "research" and profiteering? 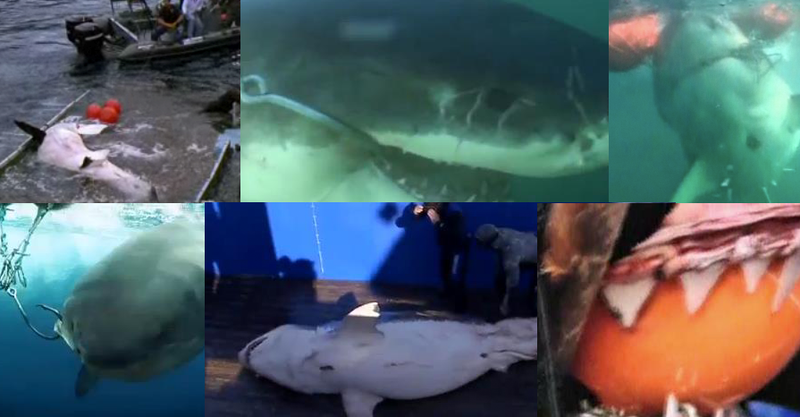 Can you name any sharks that have been killed by Ocearch since Junior's ordeal? I can. Notes: While the name Ocearch wasn't being used at the time Junior was injured, most of the same crew members now make up Ocearch. The full length video that claims Junior's bite marks relieve Ocearch of fault for the jaw injury is here. Instead of asking if Junior appears to have been bittern (he has, often) ask whether he looks to be in worse shape and ask how shark bites prove that the jaw injury wasn't caused by the hook injury. Ocearch, Fischer, Dormier, etc. like to claim their SPOT tags are revealing important, new information. But you need to pay attention to the fine print. For example, "We're providing data on shark movements never before discovered with this method." The important line is "with this method". Scientists already know where sharks go thanks to PAT tags. SPOT tags, when they work, simply provide similar data in a different way. Considering we have yet to act upon existing data, one must wonder if slightly more detailed data warrants damaging the animals in the process of obtaining it. Like many cases this is a case of where man should wonder "just because I can doesn't mean I should."